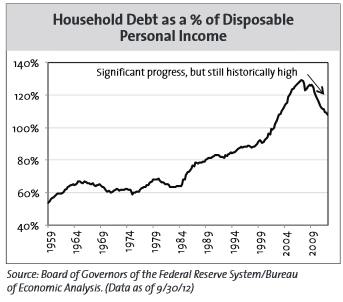 While clear progress has been made, the deleveraging process is not close to being complete. The risk of another crisis has declined, but it remains possible and should not be dismissed. Reducing the growth of debt at the right pace and in the right way is necessary, but not easily achieved. This will be an important year, as politicians are charged with putting in place a viable longer-term plan. If this is not done in 2013, the risk is that it won’t be done until after the next presidential election, unless a crisis comes first. The lost time may mean we will face even greater consequences. As challenging as the politics are in the United States, the challenges are even greater in Europe, where countries with different cultures and economic characteristics are being asked to give up some of their economic sovereignty. Solving these problems will take a long time and along the way they could trigger more serious social unrest. As in the United States, Europe’s problems are all about debt-related economic headwinds and the threat of political mishandling of a fragile economy. Europe also made progress in 2012 by reducing borrowing costs and thereby lessening the “tail risk” of an imminent eurozone breakup. There has been some improvement in the peripheral countries as most seem likely to have current account surpluses in 2013; capital flight appears to have stopped, and there are signs that the push for austerity may soften a bit. It remains an open question whether European governments will be able to make the right decisions with respect to growth policies, debt relief, and the fiscal and banking integration that is needed to hold together the single currency over the long run. We recognize a variety of bullish factors that could drive stocks to strong returns over the next five years. These factors are listed below. As we move further along in the deleveraging process, expected returns for stocks have improved. An enormous amount of “froth” has been taken out of stock prices. The stock market, as measured by the S&P 500, is at a level first reached 13 years ago and multiples are much more reasonable than they were. Relative valuations driven by the Fed’s low interest- rate policies could continue to play a big role in stock returns going forward. Stock valuations are in a fair-value range on many absolute measures. The risk of another financial crisis that leads to deflation has declined. Some deleveraging has occurred, and over time, this should impact investor risk-taking, especially if this trend continues. If politicians can agree on a credible plan for long-term deficit reduction, that could go a long way toward mitigating concerns about future debt build-up and related policy errors. In the United States, the corporate sector is sitting on a lot of cash that could be used for capital investment and hiring, as some of the uncertainty recedes. The global economy has experienced some encouraging macro developments. In the United States, housing is now a driver rather than a drag on growth. Credit markets also continue to improve with easier lending standards, and the labor market is slowly healing, though it remains historically weak. Outside the United States, the growth slowdown in the emerging markets may have ended and there are numerous signs that China’s economy is picking up (though not to previous growth levels). Even Europe, currently in a recession, could start growing again in the second half of 2013. Weighing on the positive factors listed above is the growing debt level. There is no easy road out of the debt bind. The only straightforward path would be robust growth, but this is unlikely in a deleveraging global economy. In this environment, corporate earnings will be challenged as growth through cost cutting has largely played out. We expect that in all but the most pessimistic scenarios, stocks should significantly outperform bonds over the next five years. Decent fixed-income opportunities exist outside of the investment-grade bond market, including parts of the mortgage market, short-term high-yield bonds, and emerging-markets local-currency bonds. Alternative strategies, such as flexible fixed-income strategies, can help investors capture higher returns than bonds. During 2012, our actively-managed fixed-income positions added enormous value to our client portfolios. 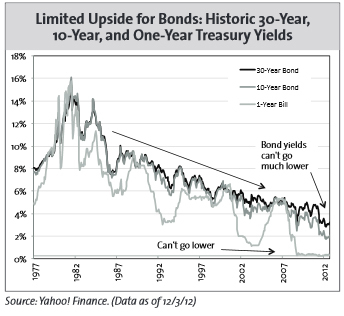 Most of the bond funds we hold pay much higher yields than the bond index and have less interest-rate risk. The lower-interest-rate risk is a function of lower duration and more credit exposure, which is likely to perform better in a rising interest-rate environment. However, yields have come down and this means lower potential returns than what we were able to capture in 2012 and over the past several years. The weight of the evidence suggests global deleveraging will create an environment that may mute returns and carry outsized risks in the short term. Our client portfolios are positioned to be globally diversified and not excessively cautious. Cash needs in the near-term (i.e. five years) should not be invested in the stock market. We hold some niche assets that we believe offer the potential to add value relative to our benchmarks. While investing in this environment can be frustrating at times, successful investing requires the patience to wait for opportunities.